Registration for Gastro 2018 is Open! It is with great pleasure that we invite you to attend the Gastro 2018 Congress, 5 - 8 December 2018 in beautiful Bangkok, Thailand! The theme of Gastro 2018 is Global Perspective in Gastroenterology. Register at www.gastro2018bangkok.com. We have prepared an outstanding scientific program that consists of four days of state of the art lectures, symposia, interactive sessions and postgraduate courses. Take part in Hotspot Sessions that will engage you in intriguing discussions and debates! For more details, please visit www.gastro2018bangkok.com. Immerse yourself in the unique culture of Bangkok while you are in town. Visit spectacular sites such as the Grand Palace and Wat Pho. Join us at Gastro 2018 for an enriching experience and expert insights on the practice and future of gastroenterology. The next World Congress of Gastroenterology, the World Congress of Gastroenterology 2019, will be held in partnership with The Turkish Society of Gastroenterology (TSG), 21 - 24 September 2019 in Istanbul, Turkey. WGO has announced the release of the new Diet and the Gut Guideline. This new Guideline, chaired by Prof. Govind Makharia of the All India Institute of Medical Sciences, Gastroenterology & Human Nutrition in New Delhi, India and Prof. Peter Gibson of the Department of Gastroenterology at Monash University and Alfred Health in Melbourne, Australia, is intended for use by health providers, including family-care and primary-care physicians, gastroenterologists, pharmacists, and nutritionists/dietitians around the world. “The general public -- and in particular those who suffer from gastrointestinal ailments -- rightly perceive their diet as being a major determinant of such symptoms and seek guidance on optimal dietary regimens.” stated Professor Makharia. Professor Gibson noted, “This Global WGO Guideline includes a set of cascades intended to provide context-sensitive and resource-sensitive options for the dietary approach to gastrointestinal conditions.” Through the WGO cascades, the WGO Guidelines program aims to provide clinical practice recommendations that are useful in many different environments across the world. With WGO “cascades,” the intention is to recognize differences in disease epidemiology, sociocultural factors, and health-care provision that exist in different parts of the world and the ways in which they preclude, in most instances, the promulgation of a “one size fits all” or a single gold-standard approach. In addition to Professors Makharia and Gibson, the global Review Team included Julio Bai (Argentina), Sheila Crowe (USA), Tarkan Karakan (Turkey), Yeong Yeh Lee (Malaysia), Lyndal McNamara (Australia), Jane Muir (Australia), Nevin Oruc (Turkey), Eamonn Quigley (USA), David Sanders (UK), Caroline Tuck (Australia), Cihan Yurdaydin (Turkey) and Anton LeMair (Netherlands). The guideline and can be accessed here on the WGO website. To see all of WGO’s Guidelines and Cascades please visit the Guidelines website. The Guidelines are available in English, French, Mandarin, Portuguese, Russian and Spanish. Next Webinar of The Microbiota Hard Talks - Live from Texas Medical Center to be Broadcast Live on 12 July 2018. The next webinar of The Microbiota Hard Talks – Live From Texas Medical Center series, “Functional Gastrointestinal Disorders and Microbiota” will be presented by Professor Eamonn Quigley, MD, PhD, David M Underwood Chair of Medicine in Digestive Disorders in Houston, USA. View the flyer here! The webinar will be moderated by Prof. Henry Cohen, MD, PhD, Former President of WGO from Montevideo, Uruguay. REGISTER NOW for the 2018 webinar series! Did you miss the previous Hard Talks webinars from 2017 and 2018? These webinars in the series, “The Microbiota of the Stomach - Helicobacter pylori and Beyond,” “Exploring the hidden world of Human Gut Microbiota,” “Use and Abuse of Antibiotics in the Microbiota Era” and “The Gut-Brain Connection: Can the Gut Control the Brain?” are available for on-demand viewing on the program website as well. To join the Microbiota Hard Talks conversation and interact with WGO on social media, tag WGO on Facebook (World Gastroenterology Organisation/WGO Foundation) and/or Twitter (@WorldGastroOrg). Be sure to include the hashtag #MHT2018 in your posts. ‘The Microbiota Hard Talks – Live From Texas Medical Center’ webinar series is supported by an unrestricted medical education grant from Biocodex France. The interactive program, directed by Professor Henry Cohen (Uruguay) and Professor Eamonn Quigley (USA), offers the chance to join experts and like-minded colleagues from around the globe on state-of-the-art microbiota topics. Each webinar features a presentation by a renowned lecturer and includes time dedicated to an interactive question and answer session. To learn more about the webinar series, visit our website. 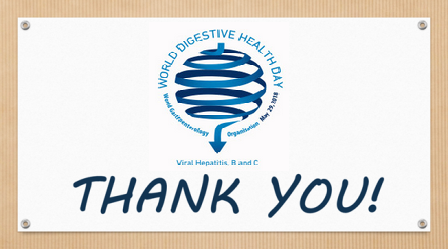 The World Gastroenterology Organisation (WGO) and the WGO Foundation (WGOF) extend our thanks and appreciation to all partners and supporters who joined us on World Digestive Health Day (WDHD), 29th May, in advocating and raising awareness for Viral Hepatitis, B and C. Although WDHD is celebrated annually on 29th May, associated initiatives and activities will continue throughout and beyond the campaign year. To access all of the highlights and happenings of WDHD 2018, including new tools and resources, continue to visit the WDHD 2018 website. If you hosted an event in support of WDHD 2018, please share with us details, photos and/or videos from the event by contacting info@worldgastroenterology.org. If you are planning an upcoming WDHD 2018 event you may submit your event here, http://www.worldgastroenterology.org/forms/submit-event.php. To join the WDHD 2018 conversation and interact with WGO on social media, snap, post and share original photos and/or videos of your WDHD events, initiatives, and activities. Tag WGO on Facebook (World Digestive Health Day - WDHD) and/or Twitter (@WGOF_WDHD), and include the hashtag #WDHD2018 in your posts. We are interested to see how you are taking action! WGO and WGOF greatly value your support of World Digestive Health Day 2018, and helping to ensure its success. WGO is proud to announce its Train the Trainers workshop in Sudan a resounding success! Since Train the Trainers began in 2001, over 1,000 educators have attended this unique program to hone their skills in adult education. The 26th WGO Train the Trainers (TTT) workshop took place this past 18 - 21 April 2018 in Khartoum, Sudan. This interactive workshop was organized by WGO and the Sudanese Society of Gastroenterology with support from the American College of Gastroenterology. It was made up of 17 modules, included lectures, small group discussions, and hands-on sessions while creating the opportunity for everybody to engage in an open discussion on many topics related to teaching and training. 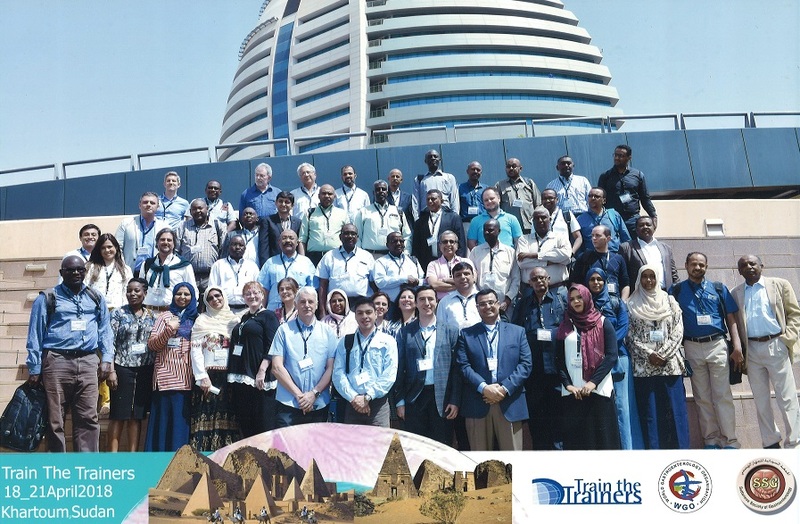 In particular, TTT Sudan 2018 was an intensive four-day course focused on improving the abilities and educational skills of trainers in the field of digestive health. Sudan 2018 brought together renowned faculty members from WGO (trainers) and participants (trainees) from 16 different countries and settings around the world, in an enabling environment to improve their potential for teaching. A two-day advanced TTT workshop, entitled “Leadership and Management II,” will be held in Porto, Portugal from 25 - 26 June 2018. This TTT features lectures in various leadership and management areas and is hosted by WGO, the Portuguese Society of Gastroenterology (PSG), and the WGO Porto Training Center. Registration for the workshop was open to all 113 WGO Member Societies as well as over 1,000 Train the Trainers alumni. WGO Member Society Information and Update requests for 2018 were sent to all WGO Member Societies earlier this year. If you have not yet done so, please respond as soon as possible. Membership dues invoices are created based on the information received in the Member Society Information and Update Forms; you will receive your 2018 invoice promptly upon completing the form. In addition, by keeping our database as current as possible you can be certain important WGO news and information are received promptly by the appropriate contacts within your member society. For more information, please click here. Your cooperation and expedient response on this matter is very much appreciated. Do you have news or events to share? We invite you to submit your events for our calendar to http://www.worldgastroenterology.org/forms/submit-event.php. You can also send us news stories via email to info@worldgastroenterolog.org. We look forward to hearing from you! Find these stories and much more at www.worldgastroenterology.org! Enjoy this news alert? Share it with your colleagues!